With release of Knight Area's debut album The Sun Also Rises on the Laser's Edge, things are beginning to happen for a band whose roots go back almost twenty years. The band's name comes from the street where founding member Gerben Klazinga (keyboardist/drummer) lives and has his studio, Ridderbuurt, translated into English. Davide Guidone spoke with the band's flautist, other founding member, and Gerben's brother, Joop Klazinga. 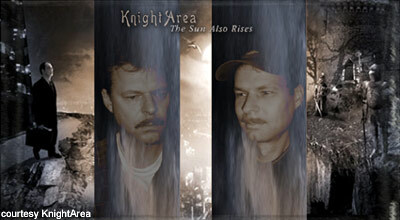 Davide Guidone: The Sun Also Rises is the first work under the name Knight Area. Are you satisfied of the final result? Joop Klazinga: Yes, we are, but it always can be better, you know. You never stop learning. We worked over 3 years on this project. In fact we are a couple of perfectionists as we are talking about music, but the result is indeed satisfying. And as we follow the reactions of the media and the fans, we can say there are more that are pleased with our album. DG: Is it an isolated project or will we wait for a new Knight Area album in the future? JK: The Sun Also Rises is a unique project; Knight Area is not. There definitely will be more, but currently it's too early to notify anything about this topic. There are already some new ideas, I can say. DG: I think that this album has a melodic style that often doesn't appear on prog albums. Do you agree? JK: I agree, Davide; we have a kind of more flowing symphonic rock style with very melodic themes and chord changes. Even though the music is rather complex with lots of layers, it's nice and easy to listen to. For example we have several reactions from children who like it very much. DG: I read somewhere that this album took almost 20 years to be completed. Is that right? KA: Well, that's not entirely true. Two tracks from the album have their roots in the 80s ("The Gate..." and "Saevis..."). We wrote and played it in the parental house. Hereafter, Gerben played for several years in the band Sangamo, but this band seldom came out of the rehearsal rooms... Early 2000 I advised Gerben to do his own thing and soon after I was very enthusiastic listening to his basic recordings, so I decided to join Gerben. DG: In the press release it's written that you have as influences among others IQ, Genesis, Arena, Pendragon and so on. What is the main one? JK: We can't say our inspiration is this or that band. Of course, when I was 16 years old I saw (and of course listened to) Genesis (with Peter Gabriel) doing The Lamb... in Amsterdam. This performance had a lot of impact on me, but there are maybe more than hundred influences. Gerben is very fond of people like Tony Banks and Martin Orford. Listening to the album, I had this idea: that you liked mostly IQ's Subterranea and Roger Waters' Amused To Death. Am I wrong? I think Subterranea is not the best album of IQ; I more into The Wake. The album from Waters you mentioned, we never heard, sorry (do we miss anything?). DG: If you had to review The Sun Also Rises what would you say? JK: I am glad I am not a reviewer myself, so I let it over to you, Davide. No, that's too easy. Well, in a former question I told already something about the music, but I think it's very dynamic, emotional and sometimes bombastic symphonic rock with huge keyboard layers, strong guitar solos and even real flute and accordion parts. DG: What kind of music listeners will like this album? JK: I guess we have a very broad public. We get positive reactions from several genres: Metal and Gothic, AOR and of course the prog or sympho fans. DG: In my opinion, the flute parts are very impressive. Why is it used only very little? DG: Did you have problems in finding a record label? JK: No, not at all. When we finished the recordings, we sent a demo to 15 record companies all over the world. We received 10 very positive reactions. First we talked to some Dutch labels, but here we missed the professionalism. After that, I had long discussions with German and Swedish companies, but they hadn't good distribution in the Benelux. Then I came to meet a Dutch rock journalist. He advised me to talk with Ken Golden from the Laser's Edge. One phone call and everything did work out fine. DG: At this moment how is the situation about the sales? JK: Beyond our expectations. It all goes very well! DG: Will you tour to promote the album? DG: If it is so, which countries will you visit? JK: Italy? We hope so!